This GROHE Essence 2-hole bathroom tap for wall-mounting has a stylish yet minimalist aesthetic. The separate 183mm spout leaves plenty of space below for trouble-free hair-washing or easily filling large vessels. Designed on a cylinder theme and presented in dazzling GROHE StarLight chrome, this wall-mounted single-lever mixer will be a visual focus of your bathroom. GROHE EcoJoy water-conservation is just one of its handy features. The built-in GROHE AquaGuide lets you set the spout's spray angle exactly. 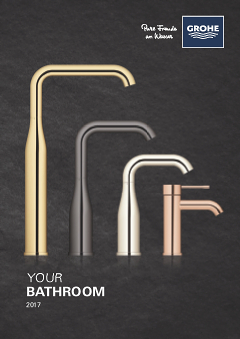 For fitting, please also order the matching GROHE concealed body (23571000). The integrated GROHE SilkMove technology lets you vary water temperature and flow with ease and precision.